Disney Donna Kay: Get Your Mickey's Not-So-Scary Halloween Party & Mickey's Very Merry Christmas Party Tickets Before It's Too Late!! 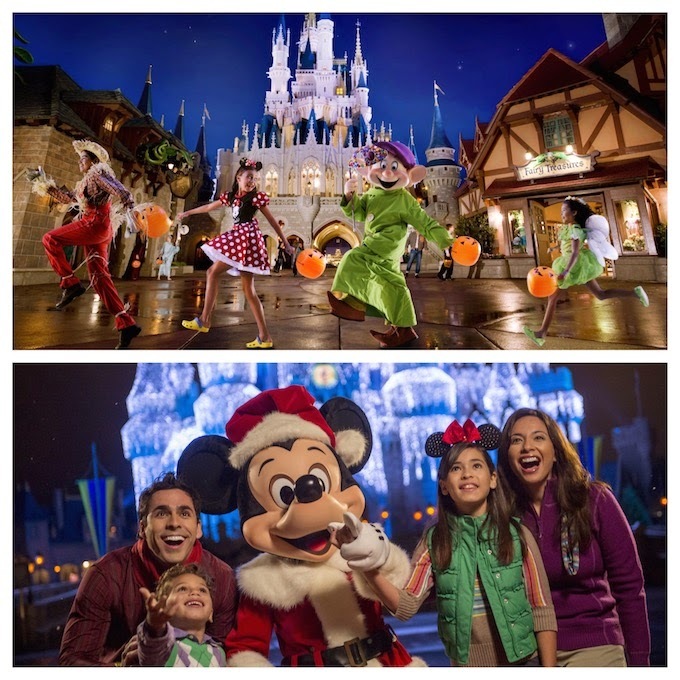 Get Your Mickey's Not-So-Scary Halloween Party & Mickey's Very Merry Christmas Party Tickets Before It's Too Late!! Tickets are finally available for the wildly popular Mickey's No-So-Scary Halloween Party and Mickey's Very Merry Christmas Party. These are two of the most popular events at Walt Disney World every year, and they will definitely sell out. (See the prices below. FYI they do NOT include tax). Wondering what all the hoopla is about? Well there's the fact that this is the only event where adults can dress as a Disney character. And there's also lots of great entertainment throughout the Magic Kingdom during Mickey's Not-So-Scary Halloween Party. The grandmaster of this bone-rattling parade has truly lost his head! A hair-raising ride by the Headless Horseman himself begins the festivities, followed by a collection of frightful floats featuring Disney Characters in Halloween costumes. Prepare yourself for the grave diggers—the Haunted Mansion stars in this delightful parade. It's really not so scary… just fiendish fun! The Ghost Host from the Haunted Mansion welcomes you to "drop in" as Disney Villains tear up the night with fireworks and wicked remixes of their theme songs. Cruella de Vil, Jafar and Oogie Boogie are just some of the scoundrels who croon their spooky tunes. Shiver in anticipation as creepy colors crawl over Cinderella Castle—complete with a finale that casts a spell you won’t soon forget! Soak up the sights and sounds as some of your favorite Disney Villains rock the stage in front of Cinderella Castle to celebrate their favorite time of year—Halloween! Then there's Walt Disney World during the holidays! The most wonderful time of the year in the Happiest Place on Earth. It doesn't get much better than that! Do you have a question about one of these fabulous Walt Disney World special events? Are you ready to buy tickets or book your Walt Disney World vacation? As a member of Guru Travel (an Authorized Disney Vacation Planner), I would love to help! You can request a quote, email me at donnakay@thewdwguru.com or call 877-825-6146 ext 706.